Grass sickness is a disease that affects horses, ponies and donkeys. It causes damage to the nervous system resulting in paralysis of the digestive tract. The cause of the disease is unknown; current research suggests that Clostridium botulinum, a bacteria found in the soil may be involved. It is not thought to be contagious. Grass sickness occurs almost exclusively in horses with access to grass. The greatest number of cases occur in horses ages 3 – 7 years old, however it can occur in all ages from 4 months to older than 20 years. Most cases are seen in the spring with a peak in May, although it can occur in any month of the year. There is no association between type of pasture and the disease. It is well recognised that certain fields and premises are associated with cases, but the cause for this is unknown. Stress is known to be a predisposing factor, with a significant number of cases having a recent history of stress such as mixing with new horses, travelling long distances or breaking. Grass sickness can occur as an acute or chronic disease. 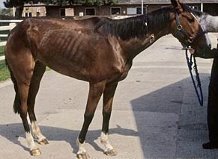 The acute form occurs suddenly and the horse will usually die or require euthanasia within 2 days of the onset of signs. The major external symptoms are signs of colic including rolling, pawing and flank watching; they may have difficulty swallowing and show excessive drooling of saliva. In chronic cases the symptoms come on much more gradually, with dramatic weight loss often being the most predominant sign. They may have bouts of mild, intermittent colic and difficulty swallowing but drooling and constipation are not shown. A definitive diagnosis can only be made by taking a biopsy of the small intestine. This is a surgical procedure that requires a general anaesthetic. As previously stated, there is no treatment available for acute cases of grass sickness. Treatment of chronic grass sickness can be attempted in some cases where the horse is not in a significant amount of pain and can still eat small amounts of food. These cases require intensive nursing. Although treatment is not always successful, survival rates are improving and the prognosis for return to work in recovered cases is good. Unfortunately there is no reliable evidence available for the prevention of grass sickness as the cause of the disease is still unknown.